Foursquare needed a significant new version. It's trying to do too much at once, and it showed: clutter. But the newest release is not only more ambitious—it wants Facebook turf—it's elegant, thoughtful, and clean. And hugely useful. 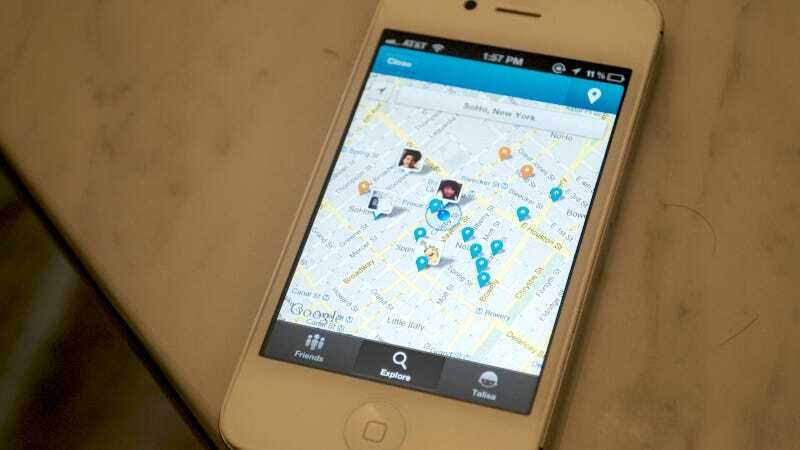 When it was first birthed, Foursquare was mostly a novelty—a list of where your friends were that hooked into your phone's new superpower of finding itself in the world. Checking in was basically an act of vanity—ergo all of the badges, points, and mayors' crowns. The "New Facebook" retains all of that, but embraces the fact that people are finally using the app for way more than a way of showing off their table at That Cool New Restaurant. Foursquare is actually useful! Unlike the lunatic chorus of Yelp, Foursquare offers information about where you can go and what you can do there by people who presumably matter to you: your friends, family, coworkers, ex-girlfriends, and allies. You can read their lists of bars you can't miss in Toronto, check the menu at the coffee shop by your office without leaving your desk, comment on your friend's checkin to ask how the danishes are, and leave a tip for the next guy to walk in. All in one app. That's a lot of stuff. Too much stuff, really. The new Foursquare consolidates this social bouillabaisse into tapas—or at least courses that fit on one plate. Gone are the multitude of buttons, the panes, the lists, the toggles. There are now just three areas in Foursquare. There's "Friends"—this is a biggie, of course. You want to see where your friends are for the same reason you want them to see where you are: the Foursquare vanity factor isn't going anywhere. But now, instead of a bland list, you've got a cascading feed if your pals' most recent geolocational jaunts, replete with big eye-filling images, comments, and the new ability to like stuff. Sound familiar? It should. The new Friends feed is undeniably Timeline-esque, and that's great—Facebook is the social feed par excellence these days. It's less orderly than the last version—your friends don't appear in a rigid list like some leger book—but it better reflects the reality of people jumping around from place to place all day. And big pictures are pretty and wonderful. Next, there's Explore. This is what Foursquare seems to be banking on—Alex Rainert, Foursquare Head of Product (in charge of making things) gushed over the potential to learn cool things about your city (or others) from your friends. Clicking Explore opens a Google Map with your friends sprinkled around you, along with recommendations based on their visits. Smart recommendations, based upon their experiences, at any given time of day, anywhere in the world. In other words, Foursquare will automatically flag new places your friends dig under the assumption you'll dig them too—giving you a modern and eye pleasing substitution for the "what is there to ______ around here?" line. You can scroll around, of course, but the shift to your immediate locale is great and intuitive, and perfect for making an unfamiliar or stale neighborhood vivid with a couple of taps. If you select a spot, you'll be able to read a host of information (tips, reviews, menus, etc) or call the place directly from the app. It looks like a superbly useful way to squeeze information out of your friends' wanderings, and seeing their faces in suspended bubbles all around you keeps Foursquare's indispensable emotional charm. Even if you don't give a damn about where these people think you should eat, it's nice to see their pixels nearby. The third and final tab is Me. Or really, you. All the rest of Foursquare's data is stuffed into this compartment within neat boxes—this is your personal record. Your badges, stats, tips, lists, friends, and settings are all here, tucked away to keep the other areas tidy an highly functional. It works. The checkin button is now at the top right instead of at the bottom center. You'll get used to it, as you get used to all things. Foursquare doesn't want to be a one stop shop in the same way Facebook or Google do, but it certainly wants a chomp out of them. And with an app as cleverly refined as this one, it can chomp at will. The new Foursquare will begin rolling out to your Android and iOS app stores today, with BlackBerry following in two weeks, and no word at all on a Windows Phone revamp. You'll have to stare at Microsoft for that one.